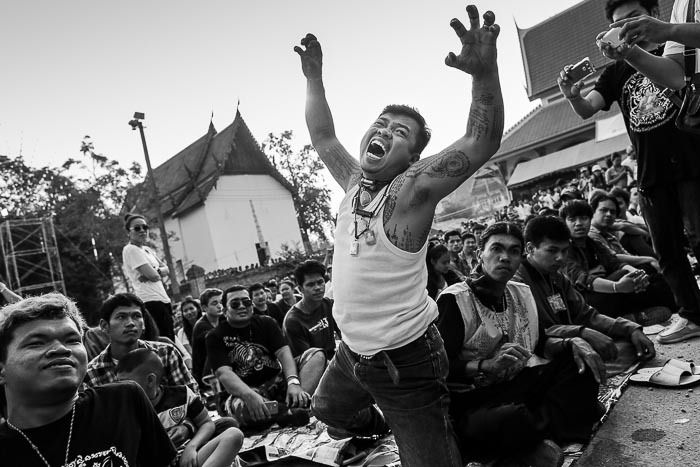 A man channels his inner tiger during the Wat Bang Phra Wai Kru Saturday. Wat Bang Phra's annual tattoo festival was Saturday. Thousands of Thais come to the temple to make merit and get their religious Sak Yant tattoos renewed or activated. Sak Yant tattoos are thought to have mystical powers of protection or omnipotence. A lot of people who work in harm's way - soldiers and police, gangsters and bandits - and their loved ones have Sak Yant tattoos. A man whose spirit is a tiger gets a tattoo refreshed at Wat Bang Phra. The tattoos are given by monks and holy men. There's always a line of people waiting to get tattooed at Wat Bang Phra. The tattoos originated in what is now Cambodia more than 2,000 years ago. The tattoos have been incorporated into Buddhism in Thailand and Cambodia but they predate Buddhism here by centuries. They've recently become very popular with Westerners and tourists who don't really understand the belief system behind the tattoos. The tattoos are given with stainless steel needles dipped in ink. The artist jabs the recipient over and over again until the tattoo is completed. There no tattoo guns or machines. The needles are sterilized with rubbing alcohol between uses. This is old school tattooing. 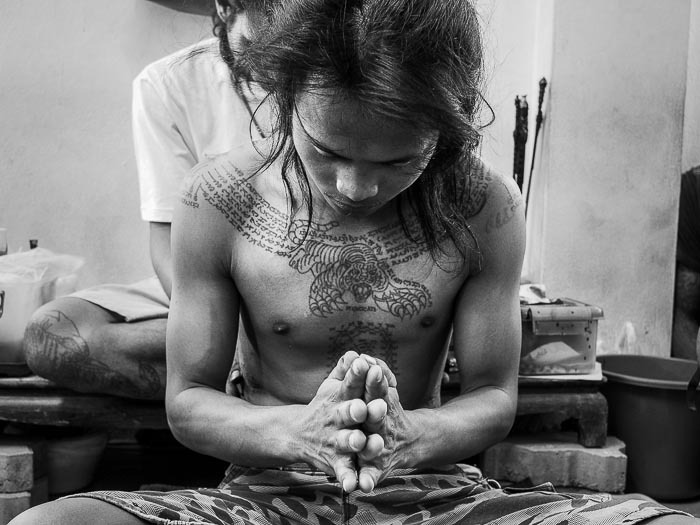 A man prays while a monk tattoos him. I went to Wat Bang Phra on Friday afternoon to photograph people getting tattoos. I spent most of Friday night photographing people getting tattoos, when I needed a break I found an empty bench and "slept rough" for about an hour. A man grimaces while getting a tattoo. This wasn't his first tattoo. Saturday morning people gather in the parking lot of the temple for the ceremony that activates the tattoos' powers. This ceremony is what's called the "tattoo festival" and now draws hundreds of tourists. A man channels his spirit animal and rushes the stage. The ceremony started at 9:39 (an auspicious time picked by the abbot) but people gather in the parking lot as early as 5:30 to get a good spot (either close to the stage or in the shade, depending on your preferences). In the hours leading up to the official start of the ceremony men (almost always - I saw only one woman rush the stage) go into a trance, channel their spirit animals and rush the stage. What persona they use depends on their spirit animal. If it's a tiger, they start roaring, extend their fingers like claws and run, either upright or on all fours to the stage. 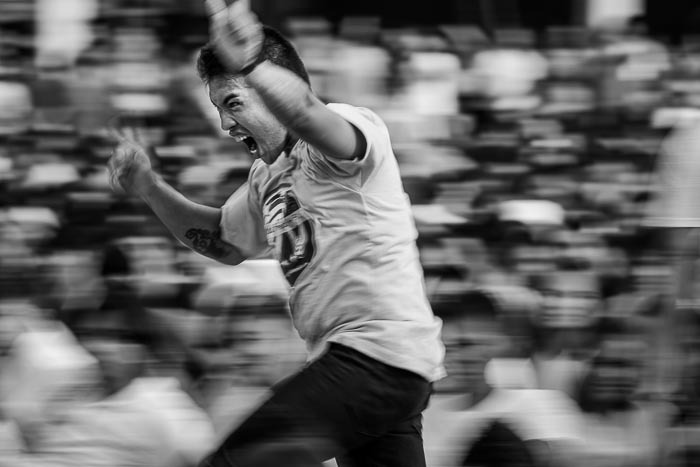 They run through, over and around the crowd, careening off spectators like carrom men. If the spirit animal is a monkey (Hanuman, the Monkey God, is a popular figure in Thai mythology), they start screeching and charge like an enraged monkey. In the course of the morning the monkeys will rise as a group, start howling and rush the stage en masse several times. These charges are bedlam. Volunteer medics (many sporting their own Sak Yant tattoos) wait at the front of the crowd to catch the men and bring them out of the trance. It's done by rubbing their earlobes and gently blowing into their ears. After they're brought back to the physical world, the men return to their place in the crowd only to rise again sometime later and charge the stage again. Medics bring a man out of his trance. This goes on all morning. It's one of the most interesting temple ceremonies in Thailand. It's also one of the most challenging to photograph. There are tens of photographers at the ceremony, all working in a small space. The possessed men charge up to stage with no awareness of what's in front of or under them and if you aren't alert to what's going on you will get hit. The medics try to keep the area clear and warn people but inevitably some tourist stops to look at the back of their camera to see if they got a picture. They usually stop to admire their work right before the charging monkey or tiger decks them. Covering the tattoo festival requires excellent situational awareness, something tourists seem to lack. 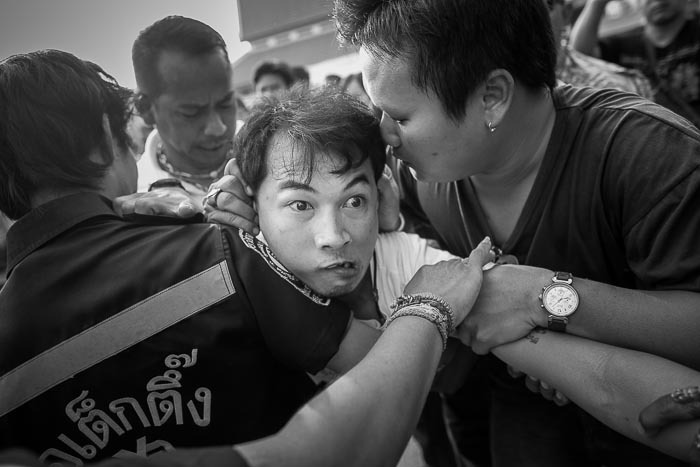 There are lots more photos of the Wat Bang Phra Tattoo Ceremony in my archive or available from ZUMA Press.